We don’t normally get excited by down jackets, but the new Seamless weaving technology from Millet is pretty impressive. Instead of sewing baffles to keep feathers in place, the French company developed a new type of loom that weaves them in place. This means the Trilogy Synthesis Down Hoodie isn’t full of needle holes which let heat out and moisture in. As a bonus, the seamless technology also saves on string weight since there is nothing to sew. 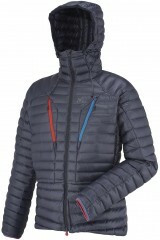 In other words, the Millet Trilogy Synthesis jackets are lighter, warmer, and more waterproof than the competition. Perfect for technical mountaineering and modern alpine ascents. This is the best down hoodie in town, period. Durable Water Repellent coating means the hoodie can be worn as an outer layer. Pre-baffle seamless build offers a new level of warmth and water-repellency. Helmet-compatible mountaineering hood has a protective visor and panoramic vision. Two zippered pockets on the chest complement the two hand warmer pockets. Additional large internal zip pocket means you have plenty of space for things. Sporty cut with an adjustable hem, collar, and cuffs make the jacket a great fit. Pretty swell piece of insulation for just about any backcountry pursuit you can think of. The jacket is so light and packs down so small (about the size of a 1L bottle) that I never hesitate to stuff it in a race pack for a day out doing laps or touring, even if it's spring and the forecast doesn't call for much in the way of backup clothing. I've even taken it to putting it in my running vest/pack for longer runs and hikes in case I stop for an extended period. Along with an e-bivy, headlamp and chemical heat packs, this puffy makes for super-light but useable emergency gear. As for actual use (not in the pack), I find the jacket quite warm for its weight, definitely a lot warmer than most ultralight jackets like a Dynafit Mezzalama or your generic "down sweater," and with a great cut for ski use. The waist is noticeably snug which looks weird when you try it on but does well avoiding abrasion/riding up under pack hipbelts (and harnesses, I suppose, if you use such things), but the shoulders/arms are much less slim-fitting to allow for good arm movement and easy pole plants on the up or down. Downsides to the ultra-light-ness are pretty obvious -- shell material rips easily, jacket wets out quickly if you're using it as an outer layer, hand pockets are in an awkward spot and not deep enough -- but none of those take away too much from the product as a whole. (Worth putting the jacket in a waterproof stuff sack, however, not the one it comes in.) 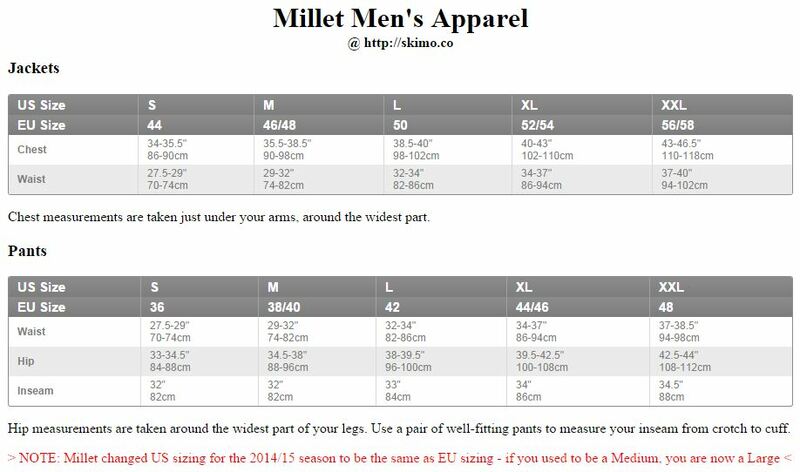 Also, as with all things Millet, size up unless you like a very Euro cut (moreso than Dynafit, similar cut to Crazy Idea). Not the lightest, if you want something that packs down tiny and weighs close to nothing look to the ghost whisperer and other low denier jackets, but decently light, weighing in at around a pound. Wish it had an internal stuff sack (i.e. turns inside out into a pocket), but instead you need to bring a little stuff sack for it. I absolutely love the over the helmet hood, every other down coat I've owned has a tight fitting hood that usually doesn't fit under a helmet, and if you cram it under looses all of is insulating capacity. I'm 5'9" 135 lbs, and a size medium fits nicely as an outer layer, too bulky to go under most shells. 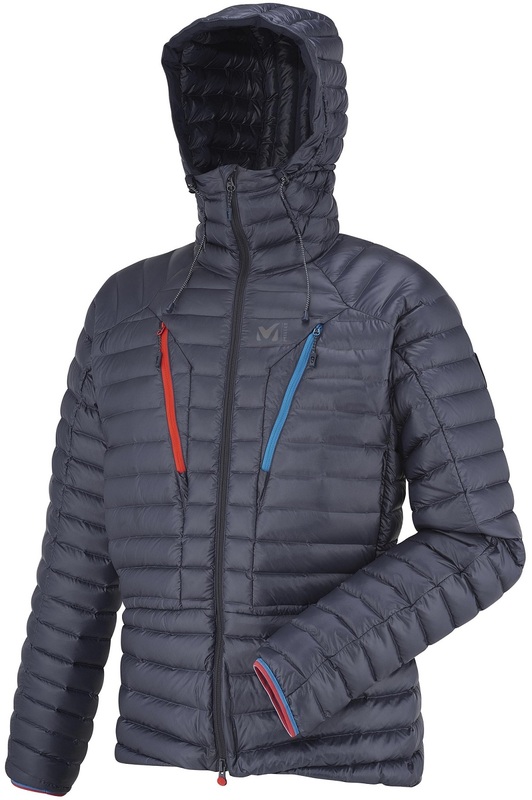 I'm looking for a jacket that's light enough to stuff in a race pack and forget about, but warm enough to serve as insulation in the event of unplanned stops/bivies/etc. Would this be warm enough to serve the purpose? A one-pound puffy has a limited ability to insulate, to be fair. Hi TSB, the description you give is exactly what how we are using this puffy. I think it's just what you are looking for.